Linda Hayden lives high above the Central San Joaquin Valley of California in the foothills of the Sierra. She and her husband, Joel, and son, Russ are cattle ranchers on the South Fork of the Kaweah River near the small community of Three Rivers, gateway to Sequoia National Park. It is here in this beautiful area that Linda collects the natural materials she uses to dye her handspun wool and create her all natural saddle blankets. Linda grew up in the Salinas Valley of California where she was greatly influenced by some of the best horsemen in California. Her interest and love of traditional horse gear started at an early age and with it came her desire to create saddle blankets similar to those of the Navajo Indian. She has been weaving for 36 years and this desire to weave the traditional wool saddle blankets has taken her to studies in Colorado and New Mexico where she concentrated on the Navajo and Rio Grande methods of weaving. 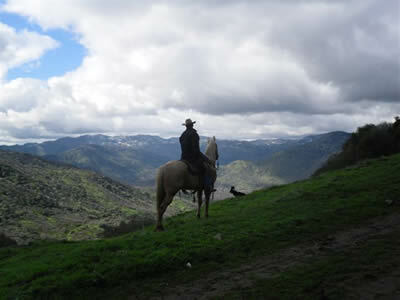 In 1994 Joel and Linda sold their ranch in the Salinas Valley and moved to Three Rivers. It was at this time that Linda started concentrated on showing her blankets in western art and gear shows. Since that time she has exhibited in Elko, Nevada, Sheridan and Cody Wyoming, Fort Worth, Texas, and numerous shows in California. She has customers through out the U.S., Denmark, England and Italy. ©2019 Linda Hayden Saddle Blankets. All Rights Reserved • Design by Eclectic Horseman Communications, Inc.